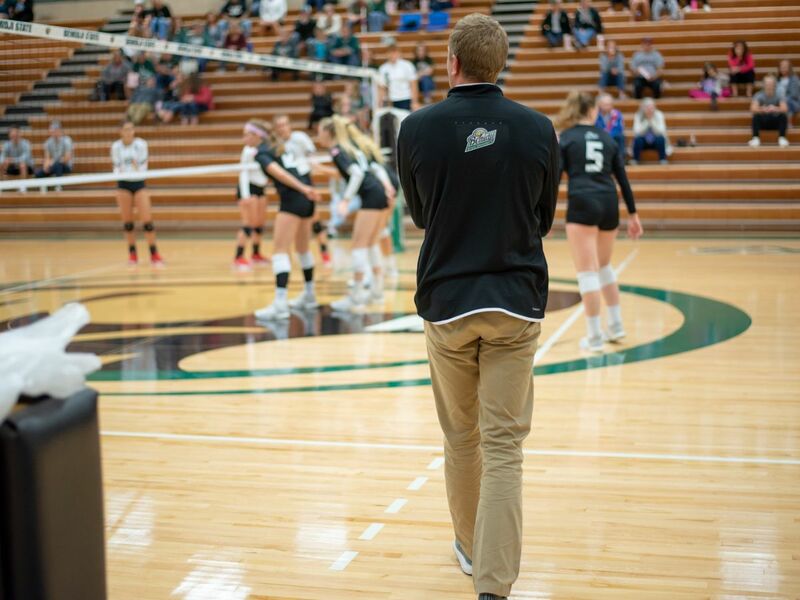 The Bemidji State University volleyball team begins a four-match road trip by traveling to Upper Iowa University and Winona State University this weekend. The Beavers (5-17, 2-12 NSIC) begin the weekend by facing off with the Peacocks (14-8, 7-7 NSIC) Friday at 6 p.m., followed by the Warriors (9-13, 6-8 NSIC) Saturday at 4 p.m.
Upper Iowa: Friday’s meeting between the Peacocks and Beavers will be just the 23rd of the all-time series dating back to 2004. Bemidji State holds the all-time series record at 13-9 but have lost four consecutive matches against the Peacocks. Bemidji State and Upper Iowa last met a year ago. The Beavers fell to UIU 3-0 (13-25, 20-25, 16-25) at home. Third-year head coach Kevin Ulmer is 0-3 against Upper Iowa. Winona State: Saturday’s clash with the Warriors will be the 96th meeting between the two programs with Winona State holding a 51-44 edge over the Beavers. Winona State has been dominant as of late and have won 16 consecutive matches. In their last meeting, the Warriors earned a 3-0 (22-25, 19-25,14-25) sweep over the Beavers in Bemidji. Bemidji State head coach Kevin Ulmer is 0-3 against the Warriors. Upper Iowa: The Peacocks enter the weekend’s action ninth in the Northern Sun Intercollegiate Conference standings. Upper Iowa went 2-1 during last week with wins over Winona State and St. Cloud State University but fell to University of Minnesota Duluth. The Peacocks are led primarily on offense by Anna Winter who ranks seventh in the NSIC with 284 kills (3.74 k/s) in 76 sets. She is joined by Kaitlin Niedert who has totaled 187 kills (2.97 k/s) and Lauren Wombles with 167 kills (2.20 k/s) who average more than 2.00 kills per set. On defense, the Peacocks are led by Haley Weepie who average 4.51 digs per set (343) while Gabby Holmes (3.47 d/s, 264) and Malissa LeClaire (3.22 d/s, 245) follow closely. At the net Upper Iowa is led by Bethany Lovhauge who has totaled 79 blocks (6s-73a) and is fifth in the NSIC with a 1.04 blocks per set average. She is followed by Lauren Wombles (7s-49a) and Haley Poula (3s-50a). Winona State: Winona State enters the weekend with a 9-13 record overall and are 10th in the conference with a 6-8 league record. The Warriors have lost four matches in a row and fell to Upper Iowa, Minnesota Duluth and St. Cloud State in last week’s action. The Warriors are paced on offense by Megan Flom and Cori Meyers. Flom leads the team with 212 kills and averages 2.94 kills per set while Meyers trails with 178 kills and a 2.51 kills per set average. Bre Maloney sets the ball for the Warrior’s attack and ranks ninth in the NSIC with a 9.86 assists per set average (799). On defense, Becca Pagel leads the team with 315 digs (3.94 d/s) while Taylor Goar closely follows with 271 digs (3.47 d/s). At the net Winona State is led by Sophie Wilker and Madison Rizner. Wilker leads the team with 73 blocks (12s-61a) while Rizner follows with 67 (13s-54a). Bemidji State: The Beavers enter the weekend tied for 14th in the NSIC with a 2-12 league record and 5-17 overall. The Beavers have fell in eight consecutive matches and fell to University of Minnesota, Crookston, No. 4 Concordia University-St. Paul and Minnesota State University, Mankato in last week’s action. The Beavers are led on offense by sophomore Anna Averkamp who has totaled 177 kills (2.39 k/s) on 489 attacks while also hitting at a .170 clip. She is followed by Julie Touchett who has totaled 147 kills (1.84 k/s) while freshman Greta Paszek follows closely with 137 kills (1.90 k/s). Senior Maddie Filipiak is the other lone Beaver to tally over 100 kills on the season so far and totals 121 kills (1.51 k/s) in 80 sets. Filipiak also leads the Beavers’ hitters by hitting at a .294 efficiency. Bemidji State’s attack is coordinated by freshman Mary Campbell who has stepped in to fill setting position after Maddie Mackinac went down with injury. Since taking over the setting duties, Campbell has come on to average 7.84 assists per set and now leads the team with 394 assists. On the defensive backcourt, BSU is led by junior Emma Hallmann and sophomore Becka Cronin. Hallmann paces the Beavers with 284 digs (3.55 d/s) and needs 83 digs to reach the 1,000 dig milestone. Cronin follows with 166 digs (2.13 d/s). At the net, the Beavers are led by Maddie Filipiak who has totaled 59 blocks (9s-50a) while Julie Touchett follows with 58 blocks (17s-4a).